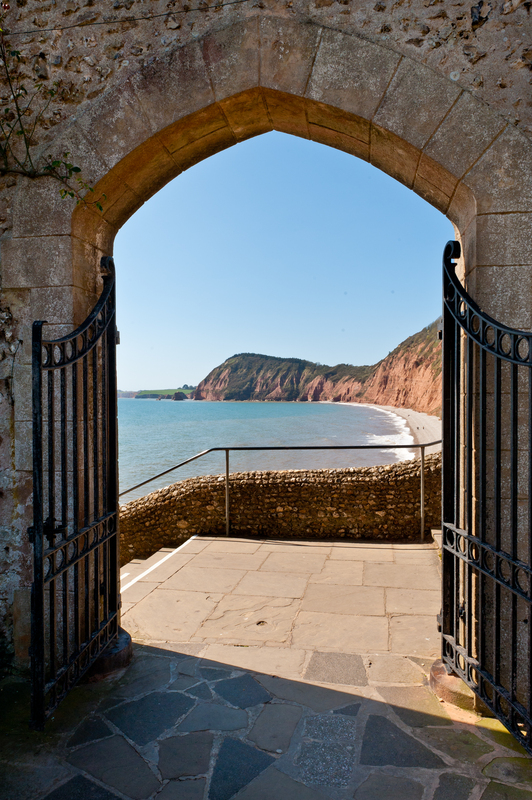 From the sandy beaches at Exmouth to the crunch of pebbles along the picturesque Jurassic Coast, East Devon’s beaches are sure to keep you and your family entertained for hours! 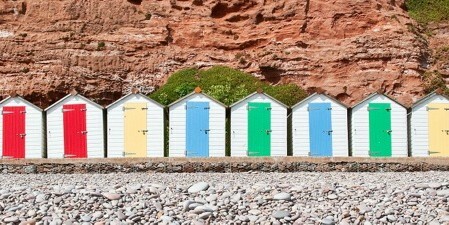 The coastline of East Devon was recently declared a World Heritage Site by UNESCO. Amazingly, due to its wealth of prehistoric remains, the Jurassic Coast is considered to be the only place in the world displaying unbroken evidence of 185 million years of evolution. 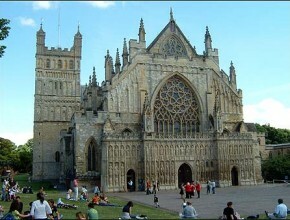 All through the East Devon countryside, out to the coast, is an amazing array of hugely picturesque and dramatic valleys.. The landscape is characterised by intimate wooded combes, vast areas of heathland, fertile river valleys and breathtaking cliffs or hilltops. It is a living, working landscape shaped by many centuries of farming activity. Many idyllic villages can be found here, and wildlife diversity is high. The opportunity to walk, cycle and tour these valleys and the high ridges that seperate them should not be missed. 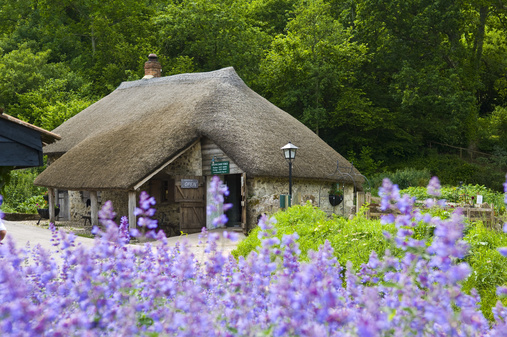 Much of East Devon, including where Burrow Wood Farm is situated, has been designated an Area of Outstanding Natural Beauty (AONB) and there are also several Local Nature Reserves to explore in this area. 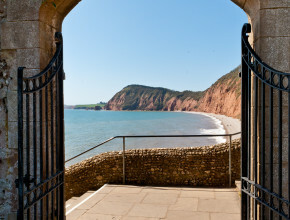 There are so many things to do in this wonderful part of Devon, that it is impossible to list all the picturesque villages, wonderful beaches, historic sites, children’s attractions, and nature reserves. To give you a little idea of the area, here are a few of the towns, villages and beaches closest to us. When you book with us, you will receive our own guide to the area, so that you can explore the area before your arrival. 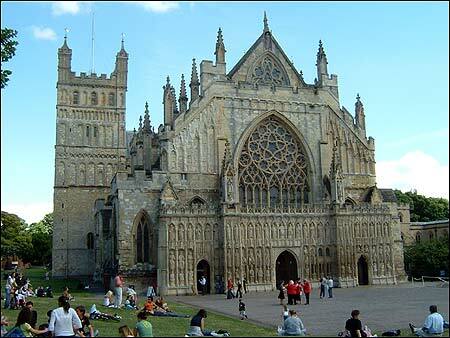 The Heart of Devon is an excellent source for more detailed information on the area. 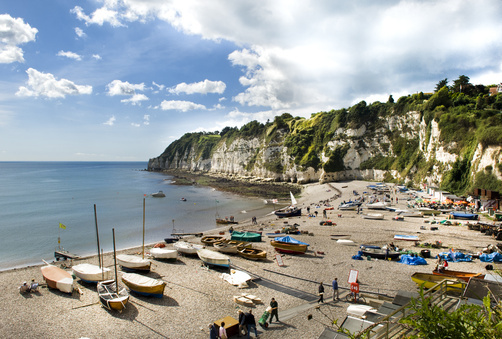 East Devon contains some of the most beautiful beaches in the UK, as well as some of the cleanest. If you would like to look at bathing water quality, before you choose where to take your dip, results for the last few years can be seen HERE. The wonderful, timeless Regency town of Sidmouth has a mainly pebbled beach, but when the tide is out, reveals a gorgeous stretch of sand. If it is sand you are after, you are best to time your visit with the tide times, as sandcastles and rockpooling are not to be missed on this beach. 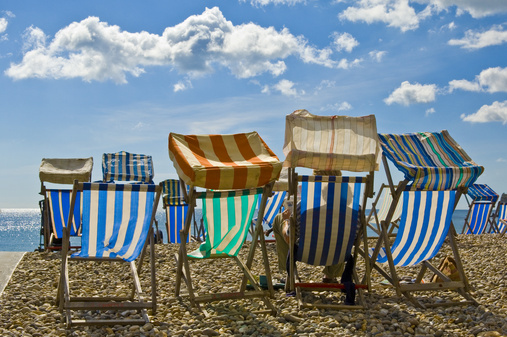 Easily accessible for our not so able bodied guests, and even just to sit on a deck chair and gaze at the UNESCO World Heritage Jurassic Coast stretching away from you in both directions, is not to be missed. 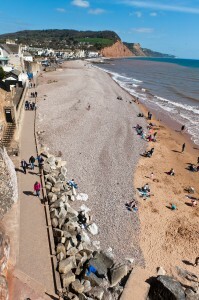 You can also climb to join this stretch of the stunning South West Coast Path, or if you are a little less adventurous with your walking, Sidmouth’s wide, flat esplanade is a lovely stroll. Amenities and paid parking are within easy reach of the beach. Excellent boutique shopping. The Donkey Sanctuary is nearby. 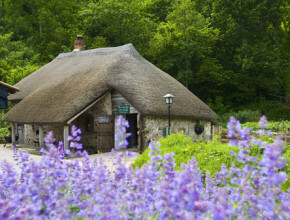 Believed to be the longest village in England, ancient Branscombe is extremely picturesque, and full of colourful cottages, and sweeping views, as you descend into its heart and on towards the sea. It has a very picturesque, gently sloping pebble beach, and the surrounding land is owned by the National Trust, and so has some lovely walks. There is a tea room and small beach shop on the beach itself, with a paying car park nestling just behind. A very picturesque historic working fishing village, Beer is also renowned for its smuggling past, lacemaking, and Beer stone. Although small, Beer’s pleasant flint-studded buildings include interesting shops and galleries, and excellent places to eat. Mackerel fishing trips are a very popular past time for visitors, or if you don’t fancy a piece of the action, then watch fisherman land their catch, and maybe take home some lovely fresh fish for your supper! 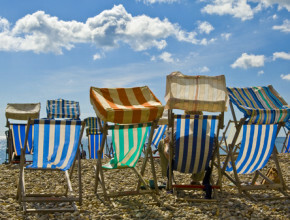 Officially Lyme Regis comes under Dorset beaches, but as we are not far from the Dorset border, it is worth a mention. 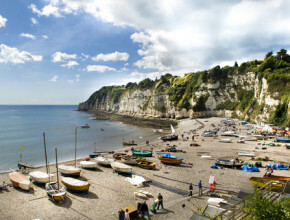 Lyme Regis is an old fashioned seaside town, with a mix of winding streets, and small shops with arcades and mini golf. The beach itself is flat, sandy, and very popular. There is also a nearby shingle beach. The famous Cob is worth a mention, it having been featured in many a film and book over the past few hundred years. 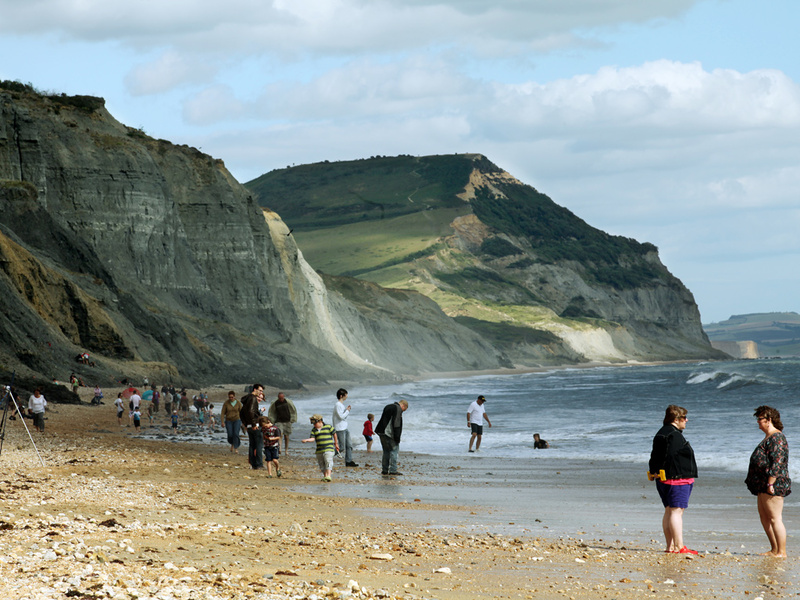 Lyme Regis is renowned for its fossil shops, and you can even partake in fossil hunts, which are well worth a go. Also, only 5 miles away is Hugh Fearnley-Whittingstall’s River Cottage, and it’s canteen, for a dining experience. 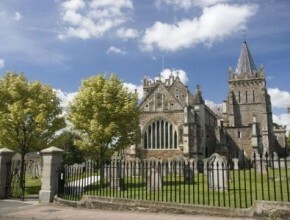 The historic Cathedral city of Exeter is not far away from us at all. 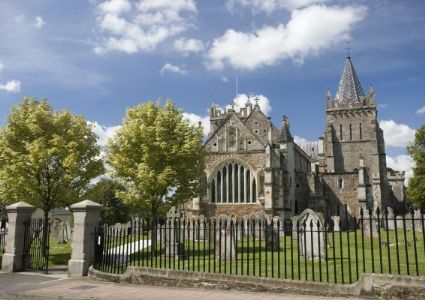 If all the peace and quiet here gets too much for you, and you long for hustle and bustle, head there for the stunning gothic cathedral, theatres, museums, a shopping experience in the new princesshay development, historic houses, and children’s theme parks.